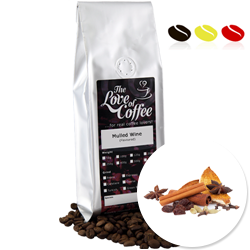 Flavour: A festive winter warmer flavoured with citrus, orange, cloves, vanilla, cinnamon and spices. Nut Allergy Advice: Please note that some coffees may contain or have traces of nuts and/or nut oils or may have been processed alongside other products containing nuts or nut oils. Write a review and share your experience to help other customers at The Love Of Coffee!